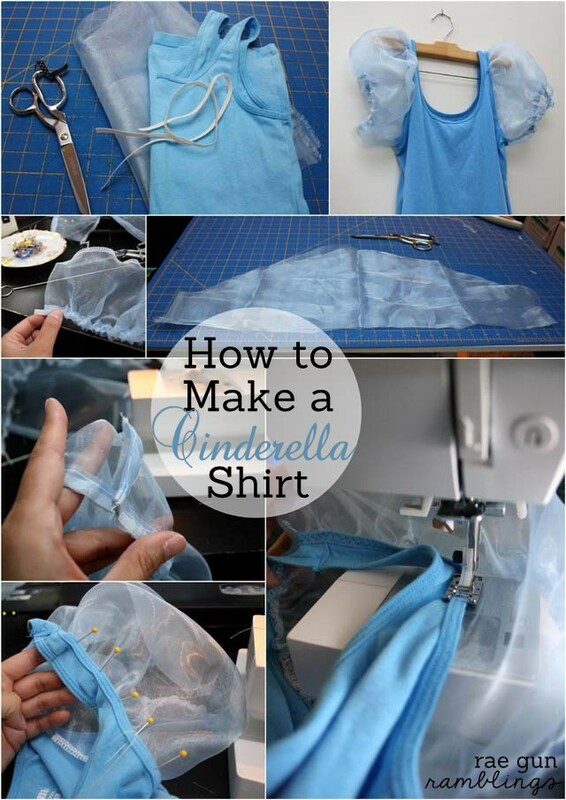 Remember that DIY Snow White Shirt that I made last year? I had so many people freak out over it (in a good way) that I knew I wanted to make all of my favorite princesses. 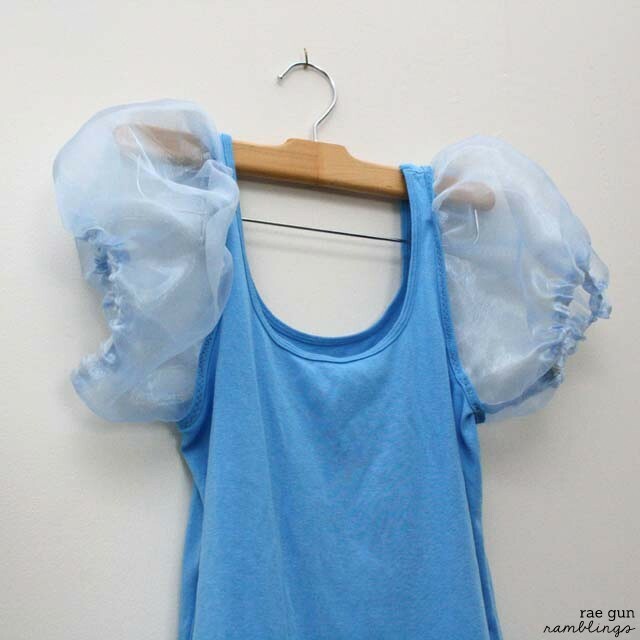 So today I’m sharing my upcycled tank shirt version for an easy Cinderella costume shirt tutorial. And as a bonus it’s the perfect low commitment level type of costume since really it’s just a super comfy tank top! It would be perfect for you overachiever types who run races and like to dress up since you can move very easily in it. 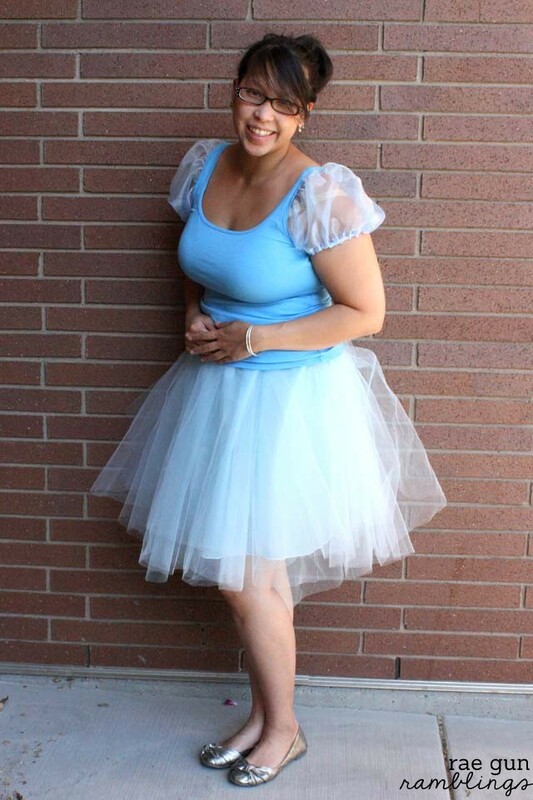 If you do want it to be a full Cinderella costume you can whip up my easy DIY tulle circle skirt and you’re good to go! I am actually hoping to find the perfect pale blue knit so that I can make one of my quick DIY Maxi Skirts to wear with the Cinderella top. And since both are so comfy it would be princess pajamas almost! 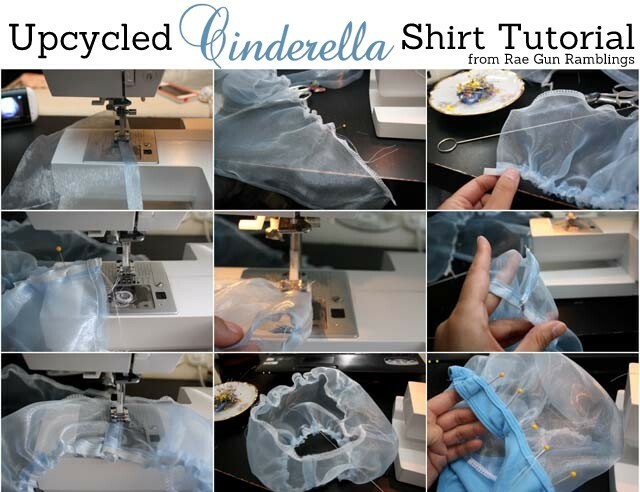 To make your own Cinderella top first start by cutting out your sleeve pieces. Either use a pattern or freehand one. You can see the basic sleeve shape in the picture above. Since it’s poofy it doesn’t have to be exact. If you have an sleeve pattern you can make it poofy just by lengthening the piece so the rounded part is extra long. If you look at my piece above each box on my table is 1 square inch. Next iron under your straight edges twice to make a casing for the elastic and sew making sure to leave enough room to thread your elastic through. Finish the rounded edge of your sleeve by serging or using a zig zag or overcast stitch on your sewing machine. Run a row of basting stitches along the rounded edge of each sleeve piece which you’ll use for gathering. Cut your elastic so that it’s about 1 inch longer than the circumference of your bicep. Thread your elastic through the casing and sew the ends of the sleeve together forming a tube. I decided to make a french seam since the fabric is transparent and I didn’t want the thread from serging to show through. You do this by enclosing the edge of the fabric from your original seam in another seam (like the pictures in the second row above). Here’s a tutorial for sewing a french seam if you don’t quite understand what I mean. Next pull your basting threads to gather and pin to your tank top. I just pin it under the edge. Note that while you sew your tank top will stretch a little so you don’t want to gather so it’s totally flush. Finally if you can adjust the pressure on your presser foot on your sewing machine set it on the lightest pressure that will minimize the stretching while you sew the sleeve in. Sew your sleeve in with a zig save stitch. I recommend starting from the arm pit so that if it stretches and you have a little bump of fabric it’s no big deal since it’s hidden under your arm. I’m glad I finally got around to making this since Cinderella has ALWAYS been one of my favorite princess. 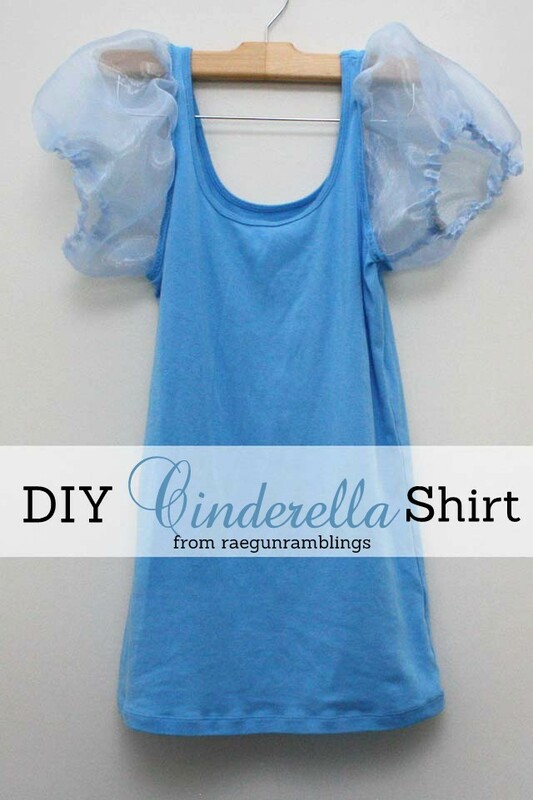 I personally believe that Cinderella is the original DIY princess. I mean after all she upcycled her mom’s dress into that pink bow awesomeness am I right? So who do you think I should do next? This project was originally shared over at Today’s Creative Blog.